As the names suggest, one group is tanned using vegetable matter and the other is tanned using a chemical process, mainly alum or chromium. Both of these tanning processes are used to create leathers in a variety of thicknesses and uses. Most large scale manufacturers will order leather processed to a particular thickness, colour and finish, whereas small manufacturers and saddlers are restricted to stock leather supplied by the tanneries. 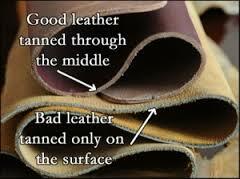 There are some tanneries that may use part of both processes to produce the required leather.